Evidence collected by Project Coyote in two parts of Louisiana from 2009-2018 should, on its own, suffice to justify maintaining the Ivory-billed Woodpecker’s current listing as an extant, endangered species in the United States. Others may differ, but I think the totality of the evidence does even more, making a compelling case that the species persists in more than one Louisiana location. This will be a two part post. The initial impetus for writing it was a conversation I had with Erik Hendrickson about how the scientific, birding, and legal approaches to evidence seem to differ. That will be the main focus of Part 2. As for Part 1, after talking to Erik, I realized that I’d never done a single post aggregating the evidence we’ve obtained over the years, so when it was announced that the U.S. Fish and Wildlife Service would be conducting a status review for the Ivory-billed Woodpecker, the need for writing this up became more urgent. That’s the primary focus of Part 1, but some of what I’m planning for Part 2 will be foreshadowed in this lengthy treatment. There is a strong tendency to privilege visual evidence over other forms – audio and circumstantial. I’m inclined to think that our audio evidence is the most compelling material overall; as regular readers know, I also think circumstantial evidence, feeding sign in particular, is very important. But the structure of this post will track conventional attitudes, starting with visual material followed by a discussion of sound recordings and auditory encounters, and concluding with more circumstantial forms of evidence. Project Coyote has been focused on two areas in Central and East-central Louisiana. I found what I call the “old” search area after reading a newspaper account of a local landowner’s efforts to get his reports taken seriously. This is the landowner who sketched corrections to the Louisiana Hunting Guide’s ivorybill illustrations and who showed Frank Wiley (my late collaborator) bark scaling when he visited the area. To be clear about what he was trying to show in the corrections: the gentleman died before I had a chance to meet him, but as Frank told me after his August 2009 interview, all of the corrections are in red ink, so the intent was not to put a male crest on a female bird; it was to show the female’s crest as more erect and recurved than the drawing and indicate that the male’s crest also is more erect and prominent (less Pileated-like) than the game guide representation. Also note the drawings at top right, in which he compared IBWO and PIWO wings, implying that the wings in the game guide image are a little too rounded. What’s most salient about these observations is not whether they are perfectly accurate, although they do seem to reflect some little-known nuances, it’s that the landowner had enough claimed observations of male and female ivorybills to recognize subtle differences and to distinguish them from Pileateds. In addition, he was offended by the treatment he received when he tried to alert the authorities. I have personal knowledge about this last aspect based on conversations with family members who wanted to see him vindicated. He was certainly convincing enough for Frank to start visiting the property on a weekly basis during the summer of 2009. Thus, Project Coyote was born. The landowner’s reports go back to the 1990s. (The linked post includes audio from 2009). There are several medium to large state WMAs and National Wildlife Refuges in fairly close proximity to the site. We heard additional claims from residents of the area while we were focused there. Putative ivorybill activity on the property seems to have diminished or ended altogether after an adjoining parcel was logged in late fall 2010. As a result, we gradually shifted our attention to the new search area. The old search area received minimal attention during the post-Arkansas period; some peripheral Ivory-billed Woodpecker-related research was conducted in the general vicinity, but there was no formal, funded search effort. Nor was it visited by Cornell’s Mobile Search Team, although Martjan Lammertink did spend several days on site, after the logging. Similarly, our “new” search area was entirely off the radar. It doesn’t show up on anyone’s list of promising locations, notwithstanding the fact that it is in one of the most sparsely populated, heavily forested parts of the state. There’s also a long history of local reports. Most of the claims seem to have been fairly recent, but some go back to the late 1990s. And these are only the claims I know about . . .
For reasons that I hope will become clear, I have not kept track of all our possible sightings since 2009 and have not always mentioned them in blog posts. Nevertheless, I’ll begin with sightings. Over the years, Frank had more possibles and reported having better views than anyone else. I’m probably second, with approximately six since 2009, but unfortunately no good looks. Steve Pagans has had several possibles; a few visitors have also made claims. While this is largely a subject for the next post, it’s well-known that eyewitness testimony is unreliable, at least when the source is an untrained observer. Nevertheless, eyewitness testimony is central to many a criminal trial, and it has a strong impact on jurors. There seems to be a parallel with respect to the ivorybill. Accounts of possible sightings tend to attract more interest than many more substantive and important posts. Thus my Sunset Sighting post, which is not quite two months old, has had approximately 800 pages views, but my March 18, 2017 post entitled, Numerous Kent-like Calls Recorded on March 11 and 15, 2017 received a total of 744 views last year. Similarly, the post on Joseph Saucier’s October 2017 sighting and our follow-up visit to that location, Change of Pace Change of Place, posted in late November, received 804 page views, the second highest total for the year, (well behind the announcement of Frank’s passing). According to a survey conducted in the aftermath of the Arkansas controversy, “[R]espondents were most confident in the sightings, less confident in the Luneau video and recordings of double-knocks and kent calls, and least confident in the FishCrow video.” The discrepancy was strongest for the “Definitely of IBWO” category, where 22 people listed sightings as conclusive, compared to 10 for the Luneau video, 9 for kent calls, 8 for double knocks, and 4 for the first Fishcrow video. (PDF) The Great Ivory-billed Woodpecker Debate: Perceptions of the Evidence. Available from: https://www.researchgate.net/publication/259337980_The_Great_Ivory-billed_Woodpecker_Debate_Perceptions_of_the_Evidence[accessed Jun 28 2018]. So sightings have an almost irresistible appeal; in some cases, there’s good reason to credit them, but it is very difficult to separate the wheat from the chaff, to determine what’s trustworthy and what isn’t. And there are many kinds of chaff – wishful thinking, self-delusion, ignorance, mistake, and deception to name the most obvious. I’ve retrospectively rejected a couple of my possible sightings (and almost did so with the recent “Wooden Wings” incident), partly because I’m disposed to look for reasons to doubt myself and partly because I realized that I was in some way primed in a couple of those instances; for example, in one case, I’d been looking at specimens the day before. In the absence of a good look, I think it’s better to err on the side of self-skepticism. When it comes to claims from others, it’s impossible to know with certainty what someone else saw, even when reports are accompanied by detailed sketches and field notes, as is the case with several of Frank’s sightings. I was with him for one, on April 3, 2015, when he made notes (available at the link) and a sketch (at my urging). I have no doubt that he was convinced he saw an ivorybill, as he was visibly shaken immediately afterwards and was very slow to regain his composure. But I really like corroboration, and to the best of my recollection, Frank and I had two possible two-person sightings in all our time together – the first was in the old search area, the day after an auditory encounter and a week before a suggestive trail cam capture was obtained, effectively from the same spot. I consider this my strongest possible sighting. The second was much weaker, a flyover with two birds seen in silhouette within 15-20 minutes of an ADK series. (Three of my possible sightings, two of which Frank also saw, have been associated with ADKs.) We did not think much of this possible at the time but could not explain it away entirely. I should add that Frank had several other two or more person sightings, but I was not present for those. With regard to the local reports, I’m always mindful of the possibility that I’m being played, especially as an obvious northerner in rural Louisiana, but I don’t think that has ever happened. It’s still necessary to listen closely and ask the right questions. Pileated, Red-headed, and even Red-bellied Woodpeckers can be confusing for non-birders. I’m more likely to credit accounts from people who make it clear they know Pileateds and know the difference (like the landowner in the old search area) or from people who say they thought the ‘ones with the white backs are the males’ and the ‘ones with the black backs are the females’. I’ve heard this only a couple of times. But I like it best when we get ivorybill claims from different, unconnected people referencing the same location; this has happened in the vicinity of the current search area. To conclude, members of our group have had multiple sightings of varying quality, in two different Louisiana locations since 2009. In addition, there have been multiple claims from locals in both areas. One final note, relevant to the USFWS review: I am aware of a number of additional post-2009 claims from Louisiana (and a few from other states). In a couple of cases, Frank interviewed the people involved and found them to be credible. A cellphone video was obtained in one instance; the observers’ excitement over apparently seeing a pair of ivorybills is evident, but the quality of the video is extremely poor. In the other case, two people saw the bird and one provided a highly detailed description and sketch. There’s also Joseph Saucier’s report from last fall; our follow-up suggested that much of the habitat in this large expanse of forest was likely suitable, and Matt Courtman, who is an excellent birder, heard what he thought was a very good double knock on one of his follow-up visits. I recently posted a couple of Frank’s 2009 sightings and accompanying photographs that hadn’t been made public previously. These are the only photographs associated with possible sightings that we have obtained. Full details are available at the link; rather than recapitulate them here, I’ll focus on trail cam photos, including several that have been discussed previously plus a few intriguing ones from the old search area that have not been posted previously. These are the images I think are most strongly suggestive of Ivory-billed Woodpecker and for which I am unaware of a strong counterargument. Reconyx image taken August 11th 2009. Possible Ivory-billed Woodpecker is just below the major fork in the center tree. A squirrel can also bee seen near the suspected roost hole, higher on the trunk. Detail of August 2009 image. The red in the crest is apparently an artifact, but artifact or not, the quantity of black in the crest appears inconsistent with Pileated Woodpecker. What may be part of the white saddle is visible on the lower left. Rotated, resized image of Imperial Woodpecker in flight. The bird is angled downward and slightly away from the camera obscuring the bill and foreshortening the profile. Note the size of the putative ivorybill compared to the Pileated on the snag in the previous image. The first two have been discussed repeatedly at length in a number of other posts. Both are from the old search area; the first was taken in August 2009 and the second, which appears to show a female Ivory-billed Woodpecker, was taken in late November, a week after the sighting discussed in the previous section. The image of a bird in flight, from the new search area, is more problematic, as it is not demonstrably a woodpecker. The still above includes an inserted Imperial Woodpecker for comparison, with motion blur reduction applied to the bird captured by the trail cam. One prominent birder stated that it is a Blue Jay, but as discussed in the original post, the bird is behind the snag and appears to be as large as or larger than a Pileated Woodpecker captured on the trunk. Although we’ve determined that one of the initially intriguing images from that deployment shows a Red-headed Woodpecker, a few others remain interesting. There’s an additional image from the spring of 2010 (old search area) that has always intrigued me, though I never had a chance to examine the original. I think it shows a large woodpecker, with a black crest, high on a honey locust. If it were a Pileated, male or female, I’d expect some red to be visible in the crest, even under these conditions. Finally, there are a couple of additional trail cam captures from the old search area that I have not posted previously. By now, the original sequences are lost, and I’ve long since forgotten any details or discussion we might have had when Frank sent me the images. While they are far from conclusive, I think they are interesting enough to post in this context. At minimum, they further illustrate the challenges associated with obtaining definitive trail cam imagery. Note: If you listen to the recordings below with headphones (recommended) be aware that some have loud sounds, clarinet toots and ADKs, in the foreground. This applies to the clip from March 2013 that I recorded and to many of Matt and Phil’s recordings from March 2017. Possible auditory encounters far outnumber possible sightings, and over the years we have made numerous recordings of putative kents and double knocks (more than once in combination, which should add to their evidentiary value). Some visitors have been rewarded by hearing something within a day or two of arriving, and this has been true in both search areas, although others have been less fortunate, and I heard nothing suggestive during the most recent field season (though Matt Courtman recorded three possible calls in April of this year). I will not be including all the audio evidence we’ve obtained, just some of the material I think is most significant. Some of the putative kent calls that have been recorded over the years may be Blue Jays; it has been suggested that Matt’s calls from this spring are too low pitched for ivorybill and might be from a heron, though I think they come from the same source. Regardless, many of the calls are simply inconsistent with any known bird species, are fairly close to the Singer Tract recordings harmonically, and are perfectly consistent with written descriptions of Ivory-billed Woodpecker sounds. Note that the fundamental frequencies on many, but not all, of these calls are in the 900-925 hz range, higher than the Singer Tract recordings and possibly consistent with Blue Jay. But in the second clip above, the fundamentals of both the lower calls at the beginning and the higher calls at the end appear to be a little over 800 hz., and during the extended encounter mentioned above, the calls went on for a prolonged period without the source revealing itself as a Blue Jay, which would be typical if the animal were indeed a jay. The same applies to calls I heard and recorded in the new search area on the morning and afternoon of March 2, 2013. The morning calls went on for ~20 minutes. I did not think they were Blue Jays in the field. “Bob and I continued upstream for another half mile, located a nice spot with a good view, and I performed an ADK series, followed about ten minutes later by a series of electronic playbacks of Singer Tract ivorybill calls. Shortly thereafter, Bob heard a double rap drum, that was captured on my digital recorder. I personally don’t believe that the drum was a direct response to my ADKs as there was at least a fifteen minute interval after the last of the ADK/playback series. In my view, the audio recorded by Phil Vanbergen and Matt Courtman in March 2017 is compelling, perhaps the most compelling evidence we’ve obtained. On the morning of March 15, they recorded over 200 calls, along with a number of possible double knocks, over an approximately three hour period. The calls have lower fundamental frequencies than many of those in earlier recordings; these frequencies are considerably lower than any kent-like Blue Jay calls I’ve been able to locate online. Other suggestions have included, Red-breasted Nuthatch (too high) and Wild Turkey (no typical Turkey vocalizations were recorded that morning). Overall, the calls appear to be inconsistent with any other known species of bird, mammal, or amphibian. Their association with Campephilus-like double knocks strengthens the argument for Ivory-billed Woodpecker as the source. As far as I know, the sheer number of recorded calls is unprecedented for a single incident in the post-Singer Tract era. I was lucky enough to hear a couple of the calls on March 11, the day Phil first captured them, along with a couple more and some knocks at the same location on the following day. I’ve blogged about these recordings at length in multiple posts; I won’t repeat all that material here, but the discussions are worth reading. I will repost some of the original recordings and enhanced versions. Here is the first recording Phil made, one clip with the calls isolated and one with our talk and reactions. It may be difficult to hear the calls without headphones. In the interest of brevity, I encourage readers to visit this post for in depth analysis, various extracts, and amplified versions that highlight the calls and some of the knocks. As always, it helps to listen through headphones. I’ve discussed my bark scaling hypothesis – that a certain type or types of scaling may be diagnostic for Ivory-billed Woodpecker – multiple times over the years. As explored in a couple of recent posts, we are in the process of testing it. I won’t recapitulate the hypothesis here except to say that I remain convinced that neither Pileated Woodpeckers nor squirrels are physically capable of removing hickory bark in the manner we’ve found in the new search area. There may be other diagnostic characteristics, but my main focus is now on the hickories, since the work on that species is the most extreme outlier. Below are some dramatic examples of bark scaling (plus one image of interesting feeding sign on a sweet gum sapling that had been stripped of bark) on hickories, oaks, and sweet gums from both search areas. Twin scaled honey locust trunks, 2009 possible sighting and suggestive trail cam photo in this immediate vicinity. Scaling near top of Hickory. Conclusion: No I-b now in Chipola R. and neighboring Apalach R. swamps. Many of Kelso’s reports are mistaken, – not deliberately false, but due to ignorance and wishful thinking. There appear to be contradictions in some of his stories. I could not get any clear statement of what Ivory-bills sound like from him. He said that the local name of I-b was “Saddleback”, – which appears good but in many ways odd. Also “Van Dyke”! There certainly is no fresh sign in any area we visited indicating that the birds are present. The only possibility is that of scaling on pine; this may be solved by watching Pileateds in the pine woods. 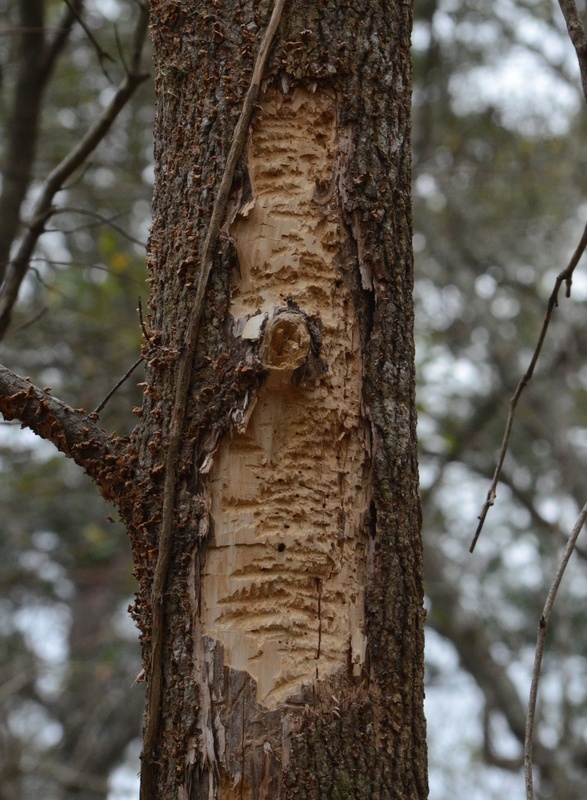 While I think it’s possible, indeed likely, that some of the work Tanner ascribed to ivorybills was done by Pileated Woodpeckers and squirrels, there’s no question that an abundance of bark scaling is relevant in assessing possible ivorybill presence in a given area. Based on visits, some lasting a week or more, to suspected ivorybill haunts in South Carolina, Florida, and Louisiana and on information provided by other searchers and people who have spent years in southeastern forests, I feel safe in saying that the quantity and quality of bark scaling found in both search areas is unusual. We also found an abundance of scaling in the area where Mr. Saucier had his sighting last year, something that I think lends added credibility to his report. In the past, many in the searcher community speculated that lateral groves or bill marks in the cambium or sapwood might be suggestive, but this view has fallen out of favor; much of what was thought to be “scaling” in these instances was in fact shallow excavation with associated bark removal. We found one example of superficial lateral marks in 2013 that continues to intrigue me, although the snag in question is a young sweet gum that could easily have been stripped by a squirrel or Pileated Woodpecker. The edges of the scaled area may tell more of a story, especially in conjunction with any bark chips found on the ground. On the trees shown above, damage to the still-adhering bark suggests that lateral blows were integral to the scaling. This would be expected if the source were a Campephilus woodpecker. An abundance of large, hard, thick bark chips (or chunks) around the base of a tree is also a likely indicator. Pileated Woodpeckers and squirrels seem to remove bark in smaller pieces and in strips. Additionally, when squirrels are involved and the bark has been recently removed, it’s likely that there will be a lot of smaller debris in the mix, since squirrels have to gnaw their way through the bark. Some of the chips we found in the old search area seem to have bill marks consistent with Ivory-billed Woodpecker. The bills of specimens, at least, seem to fit perfectly into indentations in the chips, but Pileated Woodpecker bills seem to be too small. The larger chips shown below are suspected Ivory-billed Woodpecker from a variety of species – oak, hickory, sweet gum, sugarberry, and honey locust. The specimen shots are with a honey locust chip from the old search area. The first few images show squirrel and Pileated woodpecker leavings for comparison. One of the large slabs we’ve ever found. Large bark chip with apparent bill strike. Large slabs and chips from this cluster. Cavities are vexing. I’ve become convinced that there’s no bright line for distinguishing Pileated from Ivory-billed Woodpecker, notwithstanding the dimensions Cornell gave for “large” PIWO (3.5″ x 3.7″) versus “small” IBWO (4.0″ x 5.0″). The small ivorybill sample was limited to nest holes, and I’ve certainly seen plenty of oddly shaped and large holes being used by Pileated Woodpeckers. Thus, while I keep my eyes open for cavities, I don’t think there’s a reliable way to determine which species is responsible for creating or using large, irregularly shaped cavities, although extensive bark scaling on the tree may be indicator. It has been a challenge to find cavities of any kind in our current search area, probably due in part to the high canopy. We did find a cluster of interesting cavities in what I call the northern sector in the 2014-2015 season. This cluster was in the vicinity where we’ve found an abundance of scaling over the years and where Phil and Matt made the recordings last year. Below are some of the most interesting cavities we’ve found in the two search areas. Cavities were much easier to find when we followed up on the Saucier sighting, but I’ve omitted those from this document. More cavities that are … interesting. A large irregular cavity on the underside of a limb in a Sycamore; in my recent visits, we’ve never discussed Sycamores as a tree susceptible to scaling or which might have cavities. Old cavities in dead sweet gum. In conclusion, there is an abundance of evidence suggesting that Ivory-billed Woodpeckers persist in Louisiana. It is self-evident that none of this evidence rises to the level of proof required for establishing beyond all doubt that the species has survived, but I think the case for persistence is a compelling one, without regard to evidence obtained in other areas since 2005. Stay tuned for a more theoretical discussion of evidence, proof, and professional approaches thereto. Thanks to Wylie Barrow, Fredrik Bryntesson, Patricia Johnson, Tommy Michot, Steve Pagans, and Phil Vanbergen for their input. Some photos by Steve Pagans and Erik Hendrickson.